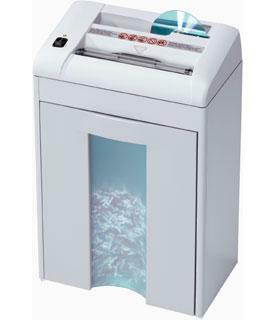 Many of the Destroyit MultiMedia Paper Shredders line of equipment can shred CDs, DVDs, Credit Cards. The added convenience of an all-in-one model means you do not have to invest in a separate unit to shred data media in your office. Although some of the older Destroyit models found on the OREweb.ca® website can shred multimedia, some legacy cross cut units cannot handle data material. Below is a listing of any unit in which both cross cut and strip cut formats can handle this type of material as an all-in-one self contained unit. The destruction of data disks and other media material "on-site" eliminates the problem of your data falling into the wrong hands. When you use an off-site-shredding service, the risk is greatly increased for lost and misplaced material to fall into the wrong hands. Data contained on credit cards, disks, CD's and DVD's can be accessed even if encrypted by just about anyone with the know how. Destruction of the material on site is the only sure way to ensure your confidential information isn't leaked, and the potential for data or identity theft to occur. The units shown below may fall into other categories on our site. Any unit with both cross cut and strip cut destruction formats are shown. 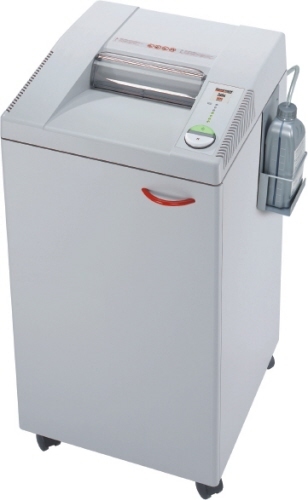 Destroyit multimedia shredders include: 2270, 2604, 3104, 3105, 3804, 4002, 4005, 4605, 4107 models. 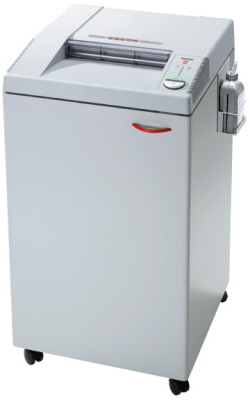 The Destroyit 2604cc cross cut is a shredder system packed with safety features and an (EMS) Energy Saving System for mid range central office paper shredding. Performance designed for department and work group multimedia applications. The high security model is a Canada Government (RCMP) Approved Multimedia shredder for destruction of paper, paper clips, staples, credit cards, and disks - CD's / DVD's / Blu-Ray Disks (Optical Media). The Destroyit 3104cc cross cut is a multimedia (CD / DVD / Blu-Ray Disk) department, central office shredder with a large sheet capacity. It provides fast through-put destruction performance. At 18 feet per second shred capabilities, the Destroyit 3104cc performance speaks for itself. 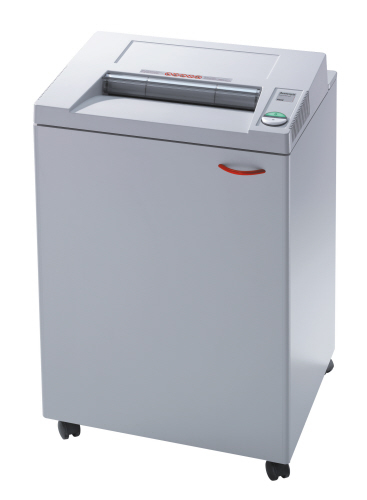 This shredder is a commercial grade workhorse designed for high volume document destruction. 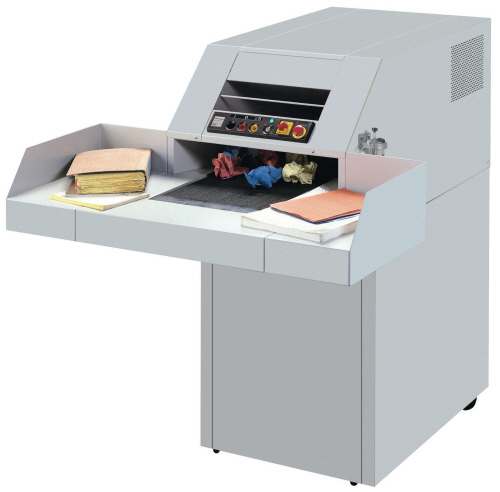 This model can quickly destroy paper, staples, paper clips, CDs/DVDs/Blueray disks, and credit cards. The cutting shafts are backed by a lifetime warranty! With a super sized 37 Gal. 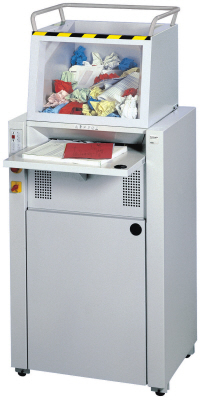 waste recovery cabinet, the Destroyit 3105cc Cross Cut high volume shredder is one of the largest capacity models available for departments and work groups. This model destroys multimedia including CD's, DVD's, Blu-Ray disks and other optical media. Like other heavy duty, high volume models in this line, it is specifically designed to handle large amounts of material daily with its 2 1/8" Hp motor. 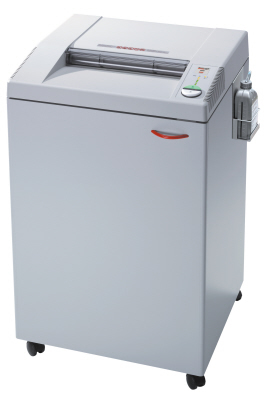 The Destroyit 3804cc Large Office Paper Shredder provides an ultra-wide format feed opening of 16". As a department or central office shredder, this model provides superior paper and multimedia destruction performance with added safety features built right in. Designed and built using superior standards, the Ideal-MBM shredder line is known through-out the world for over 50 years experience in the industry. This unit is no exception. 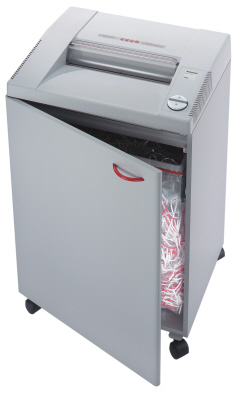 The Destroyit 4002cc cross cut Government Approved Media Shredder is designed for heavy duty, large volume use. Performance and safety are a key essentials in it's design for large offices with lots of users. NEW: The 4002cc - 3/16" x 1 1/2" (4mm x 40mm) now includes an automatic oiler. This model is constructed for continuous use with quiet operation, for destroying multimedia, including: Paper, staples, paper clips, smart cards, credit/ debit cards, CD's / DVD's, Blu-Ray disks, Optical Media. Destroyit 4005cc cross cut Shredder is a centralized department shredder designed for large work groups. The Type IIIA / Level 4 multimedia shred format is a RCMP / Government Approved model. With an ultra wide feed opening, extra large waste capacity and lifetime warranty on cutting shafts - this model is a workhorse. Destroyit 4605cc Cross Cut High Volume Shredder is a high volume bulk MultiMedia shredder designed for destroying large volumes of paper - whether the material is flat, crumpled or not uniform. This unit has one of the largest accepted sheet capacities 50 / 60 sheets (32 / 37 on alternate 4605cc high security model) in the industry. With a 7 1/3 horsepower motor it is also one of the most powerful shredders on the market today. 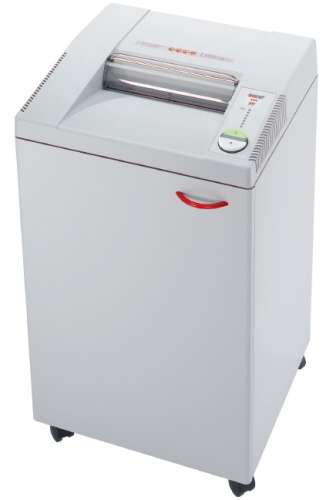 The Destroyit 4107cc Cross Cut is a High Capacity Volume shredder which is RCMP (Type IIIB / Level 3) Government Approved. Designed for heavy duty high-volume destruction of large amounts of printed matter and material daily. This model is front feed using a conveyor belt system designed for safety and fast work flow. High quality hardened steel cutting shafts allow for destruction of paper, printed matter, CD's / DVD's / Blu-Ray disks (Optical Media) and hard bound documents.